Here's what our national parks could look like in 2050. See America ‘Redwoods’ poster: original and remastered versions. Courtesy of Hannah Rothstein. California’s redwood forests and Yellowstone’s geysers are cherished national treasures. But artist Hannah Rothstein is afraid the parks will be unrecognizable in the future. 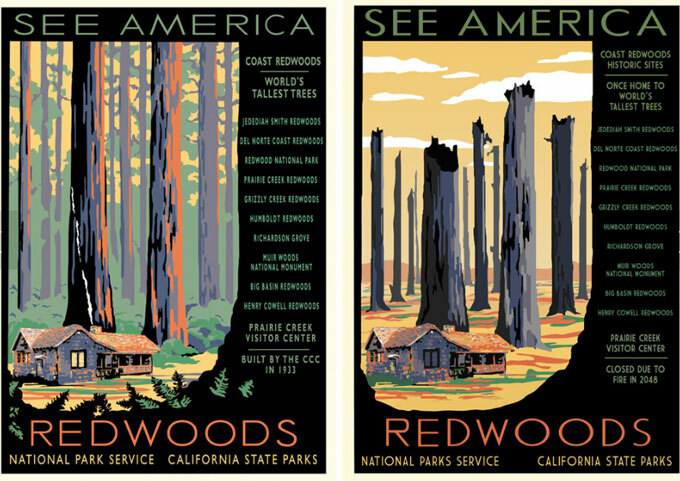 To illustrate the dangers, she’s re-envisioned a series of iconic National Parks posters from the 1930s and 40s. She also altered the wording. The “World’s Tallest Trees” became “Once Home to the World’s Tallest Trees”. Rothstein says she based her posters on scientific research. She hopes it makes people consider the consequences of a warming climate.